For some entries, pre-defined plots (so-called "figure plots" or "static plots") are available. These plots have been prepared by the editors of Pearson's Crystal Data and display e.g. a certain unit cell parameter as a function of temperature for a certain prototype. These plots cannot be modified by the user (in constrast to the Dynamic plots), so they are called "static plots" or "figure plots". 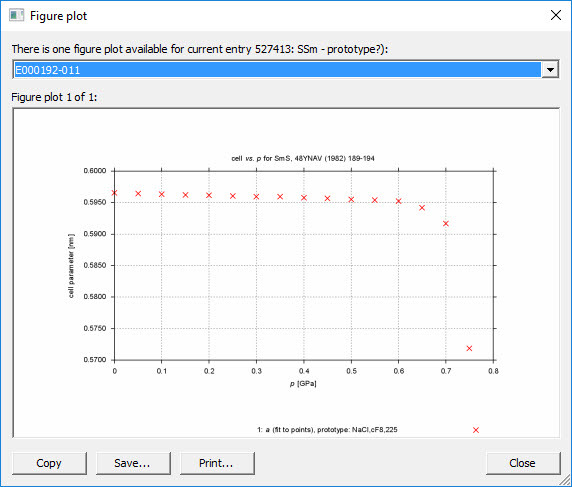 If you click on one of these links, one or more figure plots will be displayed in a new dialog window (see figure below). The plot to be displayed is selected at the top of this window (in case there is more than a single plot available). You can copy, save or print the plot by clicking on the corresponding buttons at the bottom of the window.